I appreciate the submissions that I got for this week’s Benefit’s Package Blog Carnival. Adam Fein of Drug Channels submitted a post that was near to my heart since it is a study that everyone has been talking about (in the pharmacy space). He wrote up a summary of the research that CVS Caremark published about choice of retail versus mail and what they were seeing. Like adherence, past behavior is a good indicator of future behavior. In this case, people who had used mail before, were more likely to use it again. In Dave Kerrigan’s submission, he talks about the need to Percolate the Perks. He brings up a great point around how to sustain engagement. The reality of differentiating your benefits, keeping people aware of them, and getting people to use them is a real challenge. Some of the ideas he brings up are relevant across the spectrum of engaging consumers. Building on engagement, one of the things that scares a lot of people is being misdiagnosed or given the wrong treatment (or getting surgery on the wrong body part). Evan Falchuk talks about this in his blog post on Third Place Health Care. The opportunity to get a 3rd party opinion is one that I think lots of people would like to access. And, interestingly, Jennifer Benz also talks about this in her submission about Boosting 401k Participation. Her post talks about what’s happened from a tax perspective and stressing that with the consumer. While I’m not sure of the relevance from a health benefits perspective, I did get an interesting submission from the Action For Better Healthcare blog on what Geisinger is doing around making facilities more efficient. This plays into a lot of the green architecture efforts that are ongoing (see a blog and book from a classmate of mine from architecture school). But, I found another post on the blog more interesting –an interview they posted with Karl Rowe which is interesting given the Kaiser research that many people think healthcare reform is already repealed. Next up, I thought the Free Range Communication blog does a great job of breaking out highlights from the recent SHRM report. A lot of topics of focus to the HR community are very health centric, and a lot of the trends around aging, increased use of caregivers, more people with chronic conditions, etc. are all very relevant. For those of you looking for similar data around pharmacy benefits, I just pulled out some data from another report from PBMI here. Dr. Liu wrote on Why Consumer Driven Healthcare Will Fail and also had a piece on the recent Consumer Reports story about What Doctors Wish Their Patients Knew. He draws some parallels around CDHC and 401k plans which I think is very relevant. Another post from this past week that I liked was Dr. Val’s write-up on Tabloid Medicine. Given the fiasco around vaccines and the false research, this should be a hot topic. I also liked an AMA story about Secret Shoppers and Susannah Fox’s video and writing on Healthcare Out Loud. A few other things from this week were a brief summary of some of the work Sanofi-Aventis is doing in social media, a paper on The Connected Patient by Jane Sarasohn-Kahn, and some research on storytelling and hypertension. This is a little off topic, but I think it applies well within health care. Health care is a profession where managers (like clinicians) should feel a responsibility to improve the lives of their members while making money. With that in mind, I wanted to highlight this effort. To learn more, go to mbaoath.org to learn about the history and efforts of this group (along with a new book). The March 7th edition of Time Magazine has a whole section on chronic pain including a fascinating timeline of how pain has been managed over the years. It’s just in recent history that pain has moved from being a side effect to being a condition to be management. The annual price tag of chronic pain is $50B. Lower-back pain is one of the most common complaints affecting 70-85% of adults at some point. 7M people are either partially or severely disabled because of their back pain. Lower-back pain accounts for 93M lost workdays every year and consumes over $5B in costs. 40M Americans suffer from arthritis pain. 45M Americans suffer from chronic headaches. People with chronic pain are twice as likely to suffer from depression and anxiety. One of his key suggestions – if you’ve worked with your physician for six months and its not resolved – go see a specialist. He also points you to the American Chronic Pain Association for communication tools in helping you verbalize your pain. In his article and in the other articles, it talks about stretching as a way to alleviate pain. Obviously, there are medications that can help with pain relief although some of them can be abused and addictive. And, both Dr. Oz and the other articles mention acupuncture as a potential solution. You can also go to the American Chronic Pain Association to learn more. I was surprised to see a significant drop in the percentage of clients requiring specialty medications to be dispensed at their PBM’s specialty pharmacy. There was a similar drop from 15.7% to 11.5% of employers restricting coverage of specialty drugs under the medical plan. They have some nice comments on Personalized Medicine and the critical questions to address. I was also surprised that less than 1% of employers were using onsite pharmacies or pharmacists. For the first time, they showed the percentage of employers excluding coverage of non-sedating antihistamines (e.g., OTC Claritin) and proton pump inhibitors (e.g., Prilosec OTC). Both classes have had lots of blockbuster drugs go OTC (over the counter) so it makes sense to exclude coverage. They provide a nice summary of how employers are using UM (utilization management) tools. The report has tons of data on different scenarios, different plan designs, rebates, and many other topics. I’d encourage you to go online and read thru it. BTW – The respondent group of employers included 372 employers representing 5.8M lives including both active and retired. The average group size (active only) was 9,736 which is a decent size employer group. And, 12% of the respondents were part of a union bargaining agreement. It’s not a surprise to any of us that most people are much more distracted today then they were in the past. Remember the days when there were no mobile phone, no video games, no DVDs in the car…it seems so peaceful. On the flipside, it seems so unproductive. I can’t imagine not multi-tasking. Do we learn more this way? Does this affect our social relationships? Does this change our productivity keeping in mind quality? I don’t know the answers to these (although I have opinions). But, I started thinking about this when I was reading an article in Time (Wired For Distraction). The author talks about “continuous partial attention” which is a key complication in the world of health engagement. On the one hand, I can’t tell you how many times I hear people say how critical multi-tasking is. BUT, there are times (IMHO) that you have to buckle down and focus. I remember a few years ago when I had to essentially just focus on one big project for a month. It was hard, but the project was successful. At the end of the day, there is a difference between being used to distractions and dealing with multi-tasking. Is this a prevalent issue? Yes. You don’t have to look any farther than those advertisements on TV with the father walking around the soccer field on his BlackBerry or phone. Or look at all the efforts to get people to stop texting while they drive. So, what do you want for your kids – them to be good at routine tasks or them to be good creative thinkers. Does that play into Michelle Obama’s decision not to let her kids use Facebook? Are people using the devices during their physician visit further limiting what they retain? When you send someone a direct mail piece, an e-mail, or a phone call about their healthcare, are they really hearing the information? Or are they listening to TV and reading e-mail? Or taking a phone call while watching a soccer game? Increase your attempts to change behavior (without annoying the consumer). We know the message matters, the channel matters, the person or entity delivering the message matters, and now I’m suggesting that the environment in which the information is received matters. Just another one of the many confusing messages in healthcare. Is red wine good or bad? Is this drug good for me? How do I weigh the side effects? How much should I work out? Should I stretch before I work out? Is BMI critical if I have muscle mass? Am I genetically doomed? Should I provide feedback on my physician or will I get sued? Do I have to take my drug every day or just most days? Well, I’m sure in this case moderation is important, BUT Japanese investigators have found that polyphenols in cocoa attach to genes in the liver and intestines which activate the ones that produce good cholesterol (HDL) and help suppress bad cholesterol (LDL). Great news for those of us that love sweets! Last week, I got to see one of the more interesting presentations I’ve seen in a while. CatalystRx presented on some of the work they are doing with a mobile application to be released later this year. The application uses an avatar (well technically an “embodied conversational agent“) to engage with the consumer. I’m not sure how well that will work with a senior population, but the technology (shown in a video demo) was very cool. The importance of finding the right balance between too cartoonish and too human. They referenced some Disney research about size of the eyes versus the size of the head which creates a positive memory trigger due to similarities to baby’s faces. Creating a “trusted advisor” for the patient (using David Shore’s book – Trust Crisis in Healthcare). The importance of the face and how it shows emotion (both human and avatar). How small talk engaged the consumer and builds trust even when it’s an avatar telling first person stories. Some of the research comes from Chris Creed and Russell Beale’s work. Recent research has suggested that affective embodied agents that can effectively express simulated emotion have the potential to build and maintain long-term relationships with users. We present our experiences in this space and detail the wide array of design and evaluation issues we had to take into consideration when building an affective embodied agent that assists users with improving poor dietary habits. An overview of our experimental progress is also provided. Obviously, mobile solutions as a way to engage patients using a secure environment for delivering PHI is a holy grail (for those that download and stay engaged). This was an interesting and promising variation on some of the solutions out there. I look forward to learning more and seeing it once it’s fully available. Dr. Atul Gawande wrote The Checklist Manifesto. Here’s a video of him on the Colbert Report talking about using lists. I do. I’m a big believer in the fact that they help you organize your thoughts. I also believe that in today’s day and age with all the information coming at us and the pace of change that you need to use a list to optimize on the best practice. I recently gave my team a checklist of things to do each week. It’s basically what I think about on each Friday to make sure I can wrap up the week and that I’m prepared for the next week. Last week, I had a chance to talk with Mark Merritt, President of PCMA, over the phone. I reached out to Mark as a follow-up to my whitepaper on the future of the PBM to get his thoughts on where the market was going. It was a great discussion as I appreciate Mark’s perspective. He spends his days working on behalf of PBMs navigating the changing tides of Washington. He also previously worked with the health plans so he has an appreciation for their perspective as well. My first question to Mark was about how the PBM model will change in the next 5-10 years. He reinforced for me that the PBM will continue to drive value. While some had forecasted PBMs becoming commoditized 5-6 years ago, they have continued to grow and demonstrate value time after time. But, he admitted that the exact model they hold in the future is unknown. PBMs have focused on affordability and access and with that mantra, they have continuously changed and adjusted. They’ve evolved from claims processes to trend managers. They’ve moved from mail order companies to add specialty pharmacies. They’ve moved from focusing on rebates to focusing on generics. And, at the same time, they’ve launched new technologies such as electronic prescribing and been critical to the Medicare Part D solution. We then went on to talk about how PBMs are developing a consumer brand. Mark talked about consumer branding as a company by company decision since there are a variety of factors to consider. [In my experience, some clients don’t want the PBM to be a “brand” in the consumer’s mind.] We talked about how historically pharmacy has been an after-thought to medical, but that specialty drugs may change that paradigm. We also talked about how an increased focus in preventative medicine would push pharmacy to the forefront where prescription drugs are often first-line therapy for most diagnoses. We also then talked a little about the difference between the claims processing business of the PBM and the mail or specialty pharmacy. Where the PBM has a pharmacy – patient relationship, their “brand” and awareness to the consumer is [and needs to be] different. They have to be able to engage the consumer to provide them with information and help them understand their drugs, their condition, and help them stay adherent. We wrapped up this section talking about how patient engagement improves savings whether it is on generics, mail order, or overall medical costs. Finally, we discussed Medicaid growth and some of the research that PCMA has been disseminating around the potential savings with more managed Medicaid and greater use of pharmacy management tools. The summary for me was a reinforcement of why the PBMs have survived. They focus on the patient [while making money]. They evolve to the place where the market needs a solution. They leverage technology. They invest in understanding consumer behavior. And, there are enough of them that clients can find a PBM that fits their needs whether it’s claims processing, mail order, trend management, transparency, limited networks, retail connectivity or some other point of differentiation. The holy grail of this technology is not simply to get a clean prescription sent electronically, but to minimize the more that 40% of NRxs which fall into the exception process for drug-drug interactions, step therapy rejects, or other follow-ups. (see prior post) That doesn’t even take into account the amount of times that cost is an issue for the patient leading to further work effort by the pharmacy and/or patient to get a new prescription. Obviously, cost is one of the issues which is driving the increased abandonment rate at the pharmacy. That seems a little bitter to me. The manufacturers were one of the biggest advocates of the technology early on to the point where they saw lots of opportunities for promoting their brands. Fortunately, the vendors didn’t sell out as a vendor the retail pharmacies use for messaging did years ago. That vendor allowed the manufacturers to buy out a therapeutic class and didn’t allow any plan specific messaging to be delivered to the consumer which was very frustrating. The NCPA blog talks about educating Congress about their value. They also share their slide deck . I’m not sure I see how this is community pharmacy specific, but I agree that this is a good educational deck of what pharmacists do (retail, mail, specialty). It’s more than counting pills. Educate patients and serve to support patient centered care and address MD shortage. I was surprised at the low numbers of non-Rx discussions they have per day and the low number of physician discussions. It would be good to benchmark those based on average store volume. Drug Store News has partnered up with Skipta to form a pharmacists social networking site. Interesting. 4. Wouldn’t it be great to use this to facilitate pharmacist and MD dialogue on key topics – adherence? I’m not sure what else to say on this yet. Obviously, pharmacists have the same issues as doctors – do you friend your patients, what liability do you have for what you say in these channels, is it considered medical advice, etc. Next week (2/21/11), I’ll be hosting the 6th edition of the Benefits Package Blog Carnival. You can see last week’s edition at BeyondHealthcareReform.com. If you’re interested in participating, please send your blog post to me at gvanantwerp at mac dot com. I’d appreciate submissions by Friday night (2/18), but I’ll try to include any I receive by Sunday night (2/20). Please include the name of your blog, the link to the blog post, and your name. Think about submissions that are interesting to people in the benefits space especially thoughts about how they can engage their population to more effectively manage their health. While we strongly support your efforts to provide the states with measures to drive pharmaceutical program costs down, we respectfully disagree with the statement that mail order is a potential cost-savings program strategy. Experience has shown that mail order pharmacies almost never deliver the savings they promise and are often ultimately more expensive than community pharmacies. 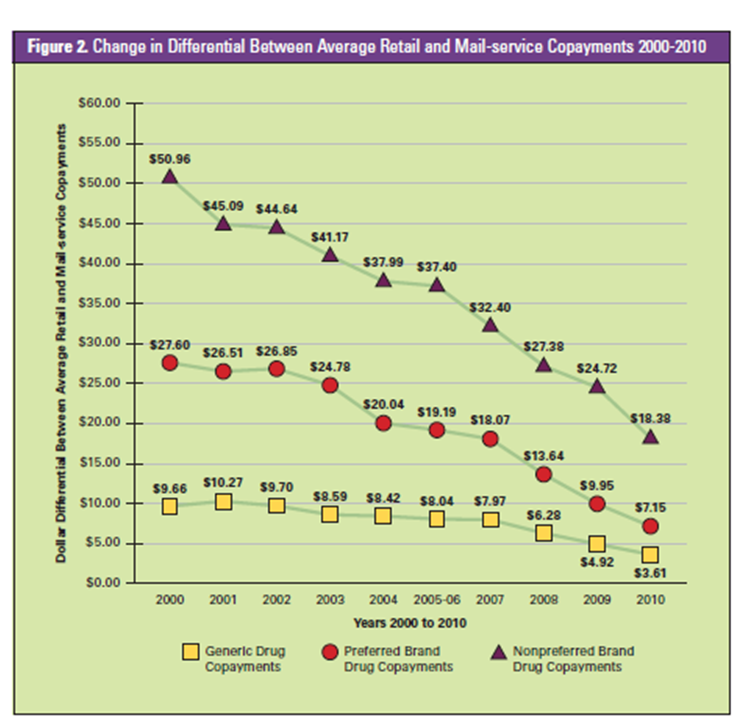 In 2009, retail pharmacies drove a 69% generic dispensing rate (GDR) while the three dispensing services of the largest PBMs – Medco Health Solutions, Inc.; Express Scripts, Inc.; and CVS Caremark – had GDRs under 58% for the exact same time period – leaving potential savings on the table resulting from increased brand usage. Either they are naïve or they think HHS is. You can’t compare the GDR at retail pharmacies to the GDR at mail order pharmacies without significant adjustment for acute medications and seasonal medications that aren’t appropriate for mail order. Historically, those medications have had higher generic utilization than other conditions (e.g., antibiotics). On the other hand, maybe they aren’t a history fan. The only independent study that I’ve seen comparing the two channels specifically on this issue was published in 2004 by Harvard in Health Affairs. It looked at claims from 5 PBMs across both channels, made the adjustments, and concluded that while retail had a slightly better GDR than mail, it had a lower generic substitution rate. It also pointed out that the majority of the different was attributed to the statin class which was over-represented in the mail order channel (and at the time was mostly brand prescriptions). Or, maybe they haven’t looked at the chain GDR versus the independent GDR…In this presentation, you see what I would expect – chain GDR > independent GDR. Combine that with the percentage of scripts dispensed (i.e., weighted average) and the normalized GDR from the Health Affairs study probably would favor PBMs over independents. Since PBMs make over 50% of their profits on generic at mail, it wouldn’t make sense for them to sub-optimize this area. Given the changes in drug mix over the past 7 years (i.e., more generics), I would hypothesize that if this study were done again you would see mail order matching or exceeding retail GDR especially GDR for independents. A common topic which I discuss with PBM clients is how to improve their mail order utilization. Since more than 50% of their profits come from generics at mail order, this is a critical process. And, while the industry average is 13% utilization (on an adjusted script basis), there are many companies (especially outside of the big 3 PBMs – CVS Caremark, Medco, and Express Scripts) that have much lower utilization and therefore huge value in upside. 1. Why is mail order important to the PBM? 2. How do you improve mail order utilization? 3. What are the challenges to improving mail order utilization? Attached are the slides which I used on the call. While I didn’t have any personal stake in the game on Sunday and am generally a college football fan, I definitely enjoyed watching Green Bay win. I’ve always liked many of Vince Lombardi’s quotes, and one of my first consulting projects was working with the Oneida Indian tribe in Green Bay. One of the two winners (it was a tie) was for Doritos and was based on a customer created advertisement (which cost him $500 to produce). Four of the top 10 advertisements (Doritos x2 and Pepsi x2) had been posted on Facebook and YouTube for days. I’ve talked about this a few times. It’s an interesting topic. Are coupons for prescriptions a good thing or a bad thing? Do they improve my marketshare? Do they protect my marketshare from new entrants? Do they protect my brand versus generic competition? Do they improve adherence (as measured by refill rates)? Per point of marketshare, is it cheaper to rebate a drug or offer direct-to-consumer coupons? I’d be interested in feedback, but I haven’t found any conclusive data. BUT, I think manufacturers are smart marketers. They wouldn’t be doing this if it didn’t work. Do the coupons improve adherence? Are they creating waste? Are the coupons changing physician or patient behavior? Is this costing me money (e.g., less generic starts)? Is this impacting my total drug spend since the consumer is no longer as price sensitive to copay differentials? Do claims processing using the coupons still show up in the patient history such that drug-drug interactions and other safety checks can be conducted? They should be asking about their total cost of the drug over time since depending on the condition they may be less likely to convert to a lower cost drug (typically generic) when the coupon is no longer offered. Or, switching drugs may require them to visit the physician or have lab work done that will cost them money. They should be asking…if others use this coupon, which means that they are filling a more expensive drug, what does that decision cost me (shared cost)? As far as I know, there are very few limitations on couponing. The state of MA doesn’t allow their use at all. There are lots of restrictions about their use in Medicare and Medicaid such that those consumers are usually excluded from using the coupons. This is generally a topic where there is little known about the answers to these questions (as far as I know). I love when someone presents a basic idea as some “new” blockbuster idea. I was just looking through a webinar from last week where it addressed a key point which is increased abandonment of prescriptions at the pharmacy. The presentation referred to a study by CVS that showed that abandonment is higher for e-prescriptions than paper prescriptions. I’ve talked about this before. That physical document (paper prescription) serves both as a reminder, but it also provides the patient with information (drug name, dose, etc) which is an important take away from their visit. BUT, this isn’t new. When I worked with the e-prescribing vendors in 2001, they knew this and offered services where a printout was created for the patient while the prescription was sent to the pharmacy. The MD writes for Drug A which is a generic. The MD goes to meet with another patient and tells the current patient to pick up a paper prescription at the counter as they pay their copay. When the patient gets their paper prescription, they see messaging around a copay coupon for a branded alternative. They then ask to see the MD again to discuss alternatives right then. Is this really just shifting that discussion from happening later to now or will it lead to a spike in this discussion and pushing it to face-to-face versus on the phone? I’ve talked before about the great experience I’ve had on the Disney Cruise Line, and Disney is often held out as a model company. Well…I just got back from a Disney Cruise last week, and I was disappointed. BUT, I learned several things about the customer experience. Let’s set the stage correctly. Disney just added a new boat (the Dream) which is 40% larger than the old boats. This was the third sailing (for the general public) although people had been on the ship for about 3 months. We booked late which impacted our choices, but we upgraded to the concierge rooms at the port. At first, we didn’t care. We’ve cruised before, and there is always a buffet to go to for lunch and dinner. Not on this cruise. Ok, we decided we could survive on room service. We tried that the first night from a limited menu, and the food was disgusting. I’d rather eat at the airport food court. Ok…in concierge, you can order from the family restaurants for room service. We did that, but the food took almost 90 minutes to get to us. That defeated the purpose. Then, to top it off, we put out our card for breakfast in the morning on the last day, and no one ever picked up the card. In the end, the kid’s club was great. Bingo was fun (we won 3 times). The new cabanas and private beach on the Disney island were very relaxing. BUT, each night as we went to wind down and have a meal, things fell apart. I spent more time chasing food and eating junk then I thought possible. Think about the doctor’s office. If the office staff doesn’t greet you, your visit satisfaction is impacted. If you’re bill is wrong, your satisfaction is impacted. Think about the pharmacy. If you have to wait too long for your medication, your satisfaction is impacted. If you don’t understand the instructions, your satisfaction is impacted. If you can’t figure out how to log into the website to order a refill, your satisfaction is impacted. This was our fourth cruise with Disney. The first three we stayed in the same room on the concierge level. By now, there were certain things we expected. All of them seemed to change. My kids love the Mickey bars (ice cream). They no longer carry them on the boat. One of my kids is super picky. He always defaulted to peanut butter and jelly if he didn’t like the food. They always carried Crustables (frozen PB&J). They no longer carry them, and when I asked for bread, peanut butter, and jelly, they couldn’t get it right. The concierge always was out to surprise you in the past – chocolate covered strawberries in your room one night or we always got a drawing to take home and frame on the last night. They no longer do that. They’ve moved to a lounge where we come to them. They no longer come to you. Lesson: It’s important to know market expectations or expectations from prior experiences and manage them appropriately. If you’ve been getting an Explanation of Benefits (EOB) for years, you’ve probably figured out some way to read it (since it’s not easy). If it’s going to change dramatically, you may want to help people understand. If you’ve been sending people a generic version of a drug that is colored red and you switch manufacturers to have a blue pill, you might want to let them know. It’s always easy to sit in the ivory tower and plan out how things will happen, but at the end of the day, I think the Disney question about “did anyone make this a magical voyage for you” summarizes it. It’s the people who make a difference. In every previous cruise, I felt like there were people who went out of their way to know who we were or who my kids were and what they liked. They then would bring them their favorite bread (banana bread) or bond with them in the kid’s club. This didn’t happen. There was one guy at Bingo who made some connection with us, but that was it. I also find it frustrating that they don’t have any “memory” of me from cruise to cruise. I have the same allergies as last time. Why don’t you use a CRM system to remember the basics about me and validate them? Lesson: Remember to empower and encourage your employees to engage the customer not simply go through the routine of talking to them. When the patient comes into the pharmacy, does the pharmacist or pharmacy technician know their name? Do they at least remember them? When your call center agents talk to someone on the phone, do they reference the prior conversations? Do they know what the customer was doing on the website 10 minutes ago that prompted them to call? Now, to top it off, the concierge level is in a gated area which I think is unnecessary, BUT the gates didn’t work. ½ the time the gates were propped open or I had to get down on the floor and put my hand thru the iron fence to reach the inside handle and open it. Lesson: Focus on what matters and doing the simple things right. Don’t over complicate the process if it doesn’t add value. How user friendly is your website? I’m sure most people use the pharmacy website for refills and formulary look-up. Are those prominent and easy to navigate. When you get information about your benefits, can you navigate it and understand it? What about lab reports? My overall impression is that someone messed up. They brought too many new cast members into a situation without enough experience. They tried to reengineer and change too many things. This should have been a great experience. Being the “chief experience officer” for Disney or the Disney Cruises has to be one of those jobs that people strive for, but my impression is that this person (a) doesn’t have kids; (b) probably never cruised with Disney before; and (c) didn’t spend enough time with the repeat cruisers to understand what they like. I’ll be interested to see if they respond to my comment card from the cruise. I always hate customer satisfaction surveys that no one takes action on. I see from the message boards that I’m not the only one disappointed with the cruise. If this was my first cruise with them, I would never cruise with them again. Now, I’m struggling with whether to go back to the old boats in the future or risk the new boats again. We originally booked for the inaugural cruise of the next Disney boat in 2012, but then they changed the inaugural cruise (what a jerk move). But, what this taught me is that experience has residual value. I had three good cruises so I’m likely to try them one more time. I hope they get it right. And, I hope you see how this translates to healthcare. We overcomplicate healthcare. We make process changes all the time. We don’t manage expectations. There is so much to do to improve this. We have to improve the customer experience in order to get them to trust us and improve our ability to influence outcomes. Will Physicians As We Know Them Disappear? It’s not new news. Physicians face a lot of pressure – new drugs, new technology, reform, ever demanding patients, lawsuits, lower pay, less time for cognitive services, … The question is whether we’re at a “tipping point”. In an article in HeathLeaders (Jan 2011, pg. 12), Walker Ray, MD who is head of the nonprofit Physician’s Foundation says there’s a “tsunami out there”. More physicians want to leave practice while baby boomers are just hitting their Medicare years and chronic conditions continue to plague us. A recent survey by the foundation which published the report – Health Reform and the Decline of the Physician Private Practice – found that only 26% of respondents said they would continue practicing the way they are in 3 years. The report talks about them becoming employees, part-time workers, and administrators. Health reform should create lots of government jobs for them. BUT, the remaining 74% said they would retire, close their practice, or seek non-clinical jobs (on top of the options above). It’s a critical issue. We had a shortage of pharmacists a few years ago. That has changed dramatically with new schools, more graduates, and technology. I’m interested to see what happens here. Could something simple like tort reform or payment reform change this trend? Could the ACO model take off and improve this? So…what is a “difficult” patient. The article describes them as patients who have lots of unexplained physicial symptoms, stress, anxiety, and other complicating factors. I think this reinforces a lot of what I talk about. You have to go back to the root of the problem (e.g., adherence) – the patient and physician encounter. We have to make this better. Patients have to understand how to leverage their physician. Physicians need to better understand their patient’s and how to engage them. Once that infrastructure exists, a lot of things can play out after the fact.